Public Sales Of Google Glass To End Later This Month : The Two-Way In an announcement, the company said Glass is not dead, it's just going through a "transition. 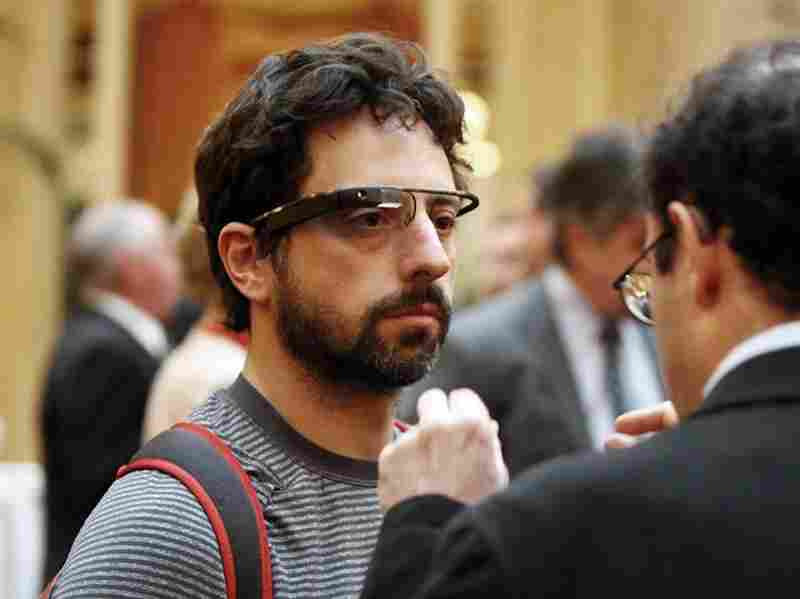 Google co-founder Sergey Brin wears Google's Project Glass prototype publicly for the first time while attending a charity function in San Francisco. Google is suspending public sales of its first generation of Google Glass next week. Google Glass Phase 1 is officially over. The Google Glass team posted a statement with the news to Google+ today. But the announcement says that Glass is not dead, it's just going through a "transition," and that the Google Glass team is "continuing to build for the future." The first, "Explorer," version of Glass was, according to the team, an "open beta" version, or basically a big, public test of the new product. The team didn't give a timeline for future versions. The statement also outlined an internal shift for Glass. The department will move out of Google[x] labs. "As we look to the road ahead, we realize that we've outgrown the lab and so we're officially "graduating" from Google[x] to be our own team here at Google. We're thrilled to be moving even more from concept to reality." Google Glass was one of the first big entries in the growing wearable technology space. It's a headset and screen, worn like glasses, that allows the user to check things like emails and calls, and even record video, by moving the head or using voice commands. The Wall Street Journal reports that today's announcement marks a strategic shift for Google. "The more secretive approach differs from Google's usual pattern. As a mainly software company, Google likes to release early versions of its products to a test group, collect their feedback and then quickly update to fix problems. That is how it rolled out Gmail in 2004. "But that launch-and-iterate approach backfired with Glass, one of the few consumer-hardware devices the company designed and built in-house. The gadget proved more difficult to update than software code running a service like Gmail." As we've previously reported, Google Glass has come under fire and had to deal with lawsuits, and even new laws over privacy and public safety concerns. Many lawmakers thought Google Glass might distract drivers, and worked on laws to keep them out of cars. The product even faced a ban in British movie theaters. Forrester Research's JP Gownder tells NPR a big part of Google Glass' problems was in the way the product was rolled out. "It's really important to remember, Google Glass was never released as a proper product," Gownder said. "It's been in beta for over two years. The Glass Explorer program was designed to be an open community of people who would contribute ideas and that sort of thing. For the mass market, Google Glass has never had a proper release." And Gownder says that meant Google had little power in shaping the public image of the product. "You can't just throw some new radical technology out there without marketing and articulating a vision, or else people will make their own conclusions about it," said Gownder. "And that's led to the privacy situation they [Google] face today." Gownder also said there's another part of the beta rollout that didn't work for Google Glass: its relationship with developers. "The thinking was that they'd generate a community of developers to develop applications for Glass," he said. But the high price point of Glass kept the market too small. "The problem is when you don't have a mass market product, you don't have a lot of people using the product, you're not gonna attract consumer developers. If there are no consumers using the product, why would developers stay with it." Gownder says he's sure that Glass is not dead, and that for all the problems with its public rollout, its enterprise arm with private companies and developers, seems to be going much better. Gownder did say Google will ultimately have to find a way to handle all the privacy concerns facing Glass. A recent survey from Forrester research found that 50 percent of online U.S. adults say Google Glass gives them privacy concerns, even though most Americans haven't even seen the product. University of Southern California journalism professor Robert Hernandez has some advice for Google's rollout of the next generation of Glass. Hernandez actually taught a recent class at USC that incorporated Glass in its syllabus. He thinks Glass version 2.0 needs to be seen and used by more people. "You've got to get it in people's hands and combat and demystify the false, negative narrative that people tagged the device with," Hernandez told NPR. "Make them [Glass] available, and in doing so, you've got do it for cheaper, so more people can play with it." Hernandez even thinks Google should sell Glass 2.0 at a loss if it means getting the device into more hands, because he thinks as soon as people use the device, they'll let go of a lot of the negative perceptions they may have about Google Glass. "All these different critiques — it's distracting, it's immersive, you're not gonna pay attention to your life — those were comments and a narrative written by folks who really didn't interact with Glass, and if they did, it was only for 15 minutes."